In the fast emerging shape of Chhattisgarh's present urban outlook & lifestyle, Aarti Infrastructure & Buildcon Ltd. is an inspiration behind many successful projects Ashoka is a respectable brand in real estate industry. 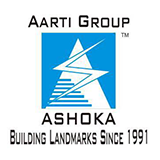 The company was incorporated as a private company on 1st Oct. 1999 and later converted into a public company with the name Aarti Infrastructure & Buildcon Ltd. w.e.f. 11th July, 2007. The promoters entered into the business of real estate in 1992. We develop land, develop colonies and townships, build multi-storied flats, bungalow and commercial complexes. The promoters are innovative and continue to be leaders since 1992 when the first project of Ashoka Tower was taken in hand. The real Emperor in real estate in Chhattisgarh & having thousands of satisfied customers throughout the state of it's clean fair & instant service at your door step. The company has successfully completed more than six Residential, Commercial, Housing Scheme Projects in Raipur.